What are Fixed Gear Bikes, Single Speed and Fixies Bikes? Fixed gear bikes or fixies bicycles are bikes with no free-wheel mechanism. This means the cyclist can not ride without pedaling, i.e. can not coast. The biker must always move their pedals in the same direction of the rear wheel when the bike is in motion. In almost every situation fixed gear bikes are single speed bikes because it is not possible to install a dérailleur. Early in the beginning of bicycle development the free-wheel mechanism was developed and used almost in every situation. Only in track racing and circus-acts the fixed gear wheel remained the standard. More recently the fixed gear bikes are becoming more popular with the urban bikers and bike messengers thanks to the simple mechanism and the direct feeling between the biker and the road. Single speed bikes are bicycles with only one-speed installed. Automatically fixed gear bikes are single speed bicycles because they have only one-speed. 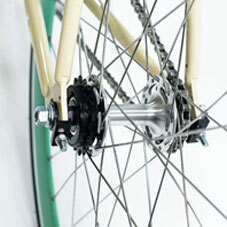 Besides this, most of our fixed gear bicycles we have are delivered with a flip-flop hub (see image below). The flip flop hub is an installation on the back wheel of the bicycle with two different tooth wheels. On one side you have the fixed gear setup and on the other side there is the freewheel setup. By taking out the back wheel, turning it and installing it again you can switch between the fixed gear setup and the single speed setup. 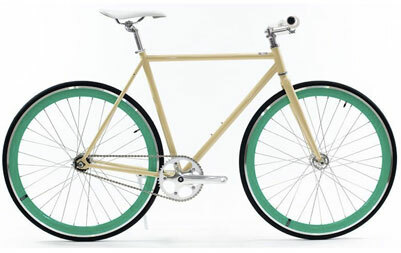 Compared to the fixed gear setup, with the single speed setup you can hold the pedals still while the bicycle is moving. WIth the single speed setup you need hand brakes as braking mechanism. How can you brake with fixed gear bikes? There are several methods to brake on a fixed gear bike. The cyclist can brake by resisting the rotation of the cranks with his legs. An other method is to use the brake levers. It's possible to install two brake levers on a fixed gear bicycle but often only the font wheel brake is installed and some have no brakes at all. The last method to brake the rider can brake by skidding on a fixed wheel bicycle. By bringing the weight of the rider on the front wheel and at the same time hold the legs still the back wheel will stop rotating and skid on the road forcing the bike to slow down. The fixed gear bikes has some advantages and disadvantages. Below we present a clear presentation of them. Image: What are fixed gear bikes, single speed and fixies? Do you want to see our full Fixed Gear Offer?